The Predator 13 from Old Town has been completely engineered - below and above the waterline - to deliver the perfect platform for fishing and on-water sporting. Old Town Pro Staff examined seating, rod placement, paddle holders and total "fish-ability" and incorporated it all into this revolutionary boat. The Predator 13 is designed to handle larger bodies of water like lakes, bays, and coastal areas. It is outfitted with the Element seating system, featuring 3 seating positions for traveling, fishing, and standing up. The slip-resistant Exo-Ridge deck ensures that you and your gear stay dry and secure. The side-mounted paddle storage, dual tackle holders, center console with Mod Pod Cover, dual-tip rod holders at the bow, side-mounted retainer bungees, molded paddle rest, removable mounting plates, Humminbird Transducer scupper, and a large bow hatch with the Click Seal cover make this the ultimate fishing kayak. The Predator 13 alters the playing field and provides a more personal connection to your environment - and the battles that take place there. 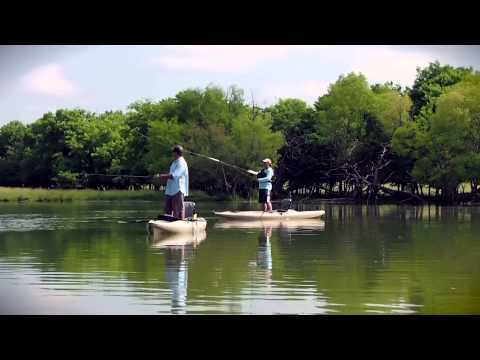 You just may find the closer you get to the water, the further you can take your game. First off I purchased this from ACK. Can't say enough about their great service. Had been on the fence about this for some time, then they had a sale for 15% off Old Town kayaks and I couldn't pass it up. Been out several times now and the Predator is awesome to fish out of! The seat is great, comfortable all day long. Nice storage pockets under seat and on the seat back.ModPod storage console is great for my gear, Plano MiniMagnums stack up nice in there, like how it is divided into 2 sections with individual access or can be completely opened up and bins removed for access inside the hull. Also the cover has a magnet on one end which is great for keeping my pliers handy. The forward hatch is spacious and has a nice seal. Perfect for storing my C-TUG cart. Speaking of carts, you will want one as this kayak is heavy, even more so once you figure out what gear you want on board and it finds a permanent home. The gear mounting plates are a plus, yakattack makes bolt on replacements with built in tracks, which I love for mounting rod holders, etc. as you can adjust your accessories should you find that rod holder you mounted would be better a couple inches one way or the other. Kayak is super stable. Not near as fast or maneuverable as my Loon 126 but it is a sit on top and its purpose is FISHING. Doesn't paddle bad at all with the seat in the low position. Significantly harder in the upper position. Looking to upgrade my paddle and that could improve. Haven't got a fish finder yet but plan to. Does come with a nice battery bag suspended in the front hatch. I do wish it had a factory installed anchor trolley, as it IS A FISHING KAYAK! Should be standard. I put one on however placement of pulleys and pad eyes took some careful thought as the lines of this kayak don't do you any favors with a trolley install. I am overall very happy with my Predator. It is a fantastic fishing platform and as long as that is your intended use you don't mind it being a little slower and heavier that a sit inside. I would definitely recommend this if you've got it on your short list. Giving 4 stars due to lack of anchor trolley and awkward lines for installing one, but that is my only real complaint. AWESOME FISHING PLATFORM! Everything is as advertised. Comfortable, stable, and everything is made with the utmost quality. Definitely worthy of a five star rating, but I have found a couple of small things that can be improved on. First there is only one paddle clip. On a $1400 kayak I wouldn't think that a second paddle clip would be unreasonable. Second, the transducer on my Hummingbird fish finder did not fit into the scupper mount as I was led to believe that it would. I was able to purchase a kit that allowed me to mount it inside of the hull which I actually prefer to protect the transducer. Bottom line, great boat that I would definitely recommend. I took a chance and purchased a Predator 13 without ever being on a sit on top kayak. I couldn't be happier, the people at ACK are the best, their prices and quality are second to none, and the Predator 13 is everything the reviews said it was and more!! I was impressed how stabile it is (I don't swim very well), and how well it tracks straight! The Predator 13 has been well thought out by the designers right down to the strap to help some of us older generation get out of that comfortable chair! Great product. great service, keep up the good work ACK!! I did research for 2 years be for deciding on the Old Town Predator 13. I followed every manufacturer, read hundreds of reviews, and watched countless YouTube video's. For my type of boating/fishing the Predator 13 continued to standout. I live on a lake and float/fish rivers about 80% of the time. With the Predator 13, I got great tracking on the lake and a great platform for fishing. On the river, I got the same great tracking, but also, great storage for a 3 day on the river camping/fishing trip. It was easy to install rod holders etc. with the mounting plates. I also installed a 6" rear hatch for additional storage. ACK did everything in an above and beyond fashion. Very professional and knowledgeable. Perfect purchase!!! Thanks ACK! *Updated* just finished my first season as another poster and here are my thoughts. First of it's a great kayak, very stable, super comfortable seat and I like the plates for mounting. Now for a few things I don't care for, and these to me warrant a 3 star review. For one, the Humminbird transducer hole is almost worthless. It's made to accept only the lowest models of HB FF that don't even have DI. If you want to use a better HB or even a Lowrance it really takes some ingenuity to come up with a way to make the larger 'ducers work. Not only that but now it sticks out farther below and is easily scrapped or even catches on my trailer. Now the trailer, I ended up having to buy one since it's heavy and was causing my neck problems trying to balance it on my head to get it on top of my car. Though I didn't take a star off because of that, just wish I had a truck but I drive too far for work to justify buying one. Another thing is the high sides, if it's windy you are SOL. It is impossible to keep it facing down wind, even with the rudder. My old kayak, I could face it down wind and I could use the wind to push me, just use my feet to adjust the rudder and have my hands free to fish. Not so with the Predator, the sides are like sails. I'll see about posting a short clip on YouTube of me getting blown around, just search "Predator, Wind". One last thing, the one way scupper plugs are worthless. They might work with zero gear but not with a loaded kayak for fishing. Once the boat is loaded, it sits far enough below the water that the water can't drain out. So for them to use that as a selling point just doesn't make any sense. Overall it is a good kayak, I just don't know if I would buy it if I were to do it all over again. Hope my review helps. Just finishing up my first season fishing from my Predator 13. I absolutely love it. I've spent days in the seat catching hundreds of fish. It's extremely comfortable. The one thing to keep in mind, particularly if you're going after large fish like Musky, as I do in northern Wisconsin...the deck space in the kayak is tight. So you need to be prepared to handle large fish when you're on your own. It only took one large Pike trashing between my legs for me to realize this. I'm better prepared now. I leave all my gear loaded in my kayak during transport. So it is a bit heavy to load and unload. But between the Seattle Spots scupper kayak cart and Seattle Sports boat rollers I use (both work great) I can load and unload on my own. It's pretty easy once you do it a few times. I transport my kayak on my 2007 Honda Civic hybrid. You'd hardly know it's up there traveling 70 mph...I recommend the Danuu cover...although, I'd design it a bit differently for this specific kayak. I honestly can't say enough about this kayak. I wanted to get at least a half dozen outings on this kayak before writing and I can now say I love this thing. I've never owned a kayak before so I have nothing to compare it to, and was unable to test drive before buying so I did tons of research first and made the best educated choice I could, and I don't regret it. I did get to see and touch one at a shop but they didn't have a pond to try out. This is a big heavy beast and with my lower back, I knew I wouldn't be hoisting it on top of my 4Runner so I opted for the Trailex trailer. Another great choice. I decided my biggest needs were comfort, space and stability in that order. The seat is every bit as comfortable and awesome as everyone else has said it is. Some have mentioned they don't like the fact that the seat isn't removable for transport, fair enough, but nothing that one bungee strap won't fix. Space wise, I'm hoping to pack it for some overnight sand bar camping here in the Ozarks and this thing has tons of room. Stability wise, this thing is great. I have stood a few times but haven't mastered it yet. I'm a little top heavy myself so maybe if I fix that problem, I won't be so wobbly standing. I'm thinking about adding the stand up tower to add to it. I'm exclusively a fly fisherman so I haven't cluttered the deck out with a bunch of stuff as it just gets in the way of my fly line, but I did add a Sea Lect anchor trolley on the side and that is a must for all the lake and pond fishing I do. Overall a great kayak for my needs. It paddles fine and seems to track well. I need work on my paddling and that will get better. Granted you're not going to win any races in it, but it's a cruiser, not a racer. I love my Predator 13! My wife and I paddled as many boats as we could for 6 months trying to make a decision. She went with the Jackson Coosa HD, (a great boat). It all came down to personal preference. I like the Predator seat system, rod pod, and molded handles. It is the most stable boat I paddled. Its primary use is river and lake fishing. Been in it every weekend since my purchase. I'm 6'0" , 214 lbs and can stand up in river currents and fish all day. I hope this helps. Just a follow up to post the Old Town Predator 13, under way. Great Yak for fishing, wont break any speed records and you definitely should consider a rudder kit. If comfort and stability is the important factors in your search for a kayak then the Predator is for you. I love this yak fishing Tampa Bay. I am top heavy from weight lifting and tip the scales at 275lbs. I go all day with this yak seat in high position. Never a worry. Love this boat! Excellent service from ACK and Estes Freight- arrived in perfect condition when they said it would. I would recommend both ACK and the Old Town Predator 13 to anyone interested in an excellent fishing platform which is extremely stable without sacrificing too much in the speed and maneuverability department. Awesome fishability, tons of storage and rigging options- love the mod pod especially the ability to store a few rods inside the yak! Can't say enough about the kayak and ACK was great to deal with! Love, love, love this boat! Excellent service from both ACK and Estes Freight. Delivered in perfect condition. I would recommend ACK and this kayak to anyone looking for an excellent fishing platform. This kayak is excellent. Great stability and easy to fish with. However the delivery was not so enjoyable. Our kayak somehow got on the wrong truck and we had to wait longer to receive which caused us some issues as you have to be there for delivery. So we had to make special arrangements. Austin Kayak rocks! I ordered two Predator 13 kayaks in urban camo along with some Scotty fishing products and a Kong Lasso cable for security. Absolutely love the look, design and stability of the new kayaks. My wife and I use the kayaks primarily for fishing in the local bayou/bay in NW Florida. We have installed Scotty deck mounts on most of the mounting plates along with Scotty rocket launcher rod holders and a Scotty anchor lock. As others have mentioned, the kayak is slow to get moving and can be tough to steer in windy/strong current conditions. However, the ability to stand up while fishing and easily move around the kayak makes up for these weaknesses. We leave the seat in the highest position for all our paddling and fishing which provides a nice storage space underneath for supplies/lure boxes/etc. I spoke with customer service several times at Austin Kayak regarding the kayaks/accessories. I also had to return a couple accessories that I didn't end up needing. They truly have one of the best customer service departments in the business. The kayaks arrived in perfect condition from Estes and the delivery driver helped me move the kayaks into my backyard. I have recommended the Predator 13 and Austin Kayak to all my friends looking for a kayak. Excellent boat. Good job Old Town! I was a little sceptical at first about the performance of the hull as it has a wide beam for a kayak. It is a slow starter but once you get it moving it performs very well and is easy to paddle. This boat is very stable and holds just about anything you want to put into it. I Would recomend a rudder when paddling in a wind. It tracks so much better and is easier to control. No compaints. I am very pleased with this boat. I would recomend it to anyone who needs a good fishing platform. To begin, I found Austin Kayak to be a great company in terms of customer service. Before my order shipped I received a phone call from a rep to ensure I had everything I needed and to discuss the shipping process. All the staff I dealt with was extremely friendly and helpful. I did encounter an issue however and was sent the Ocean Kayak Big Game Prowler II rather than the Predator 13 that I had ordered. While the kayak was on time it was the incorrect model. I called an Austin Kayak rep, David, who guided me through the process of refusing the package to the delivery driver (also very friendly and helpful) and got the correct kayak, the Old Town Predator 13, on its way. Although the issue was unfortunate it only cost me time and gave me the opportunity to examine the Predator's main competitor model up close. 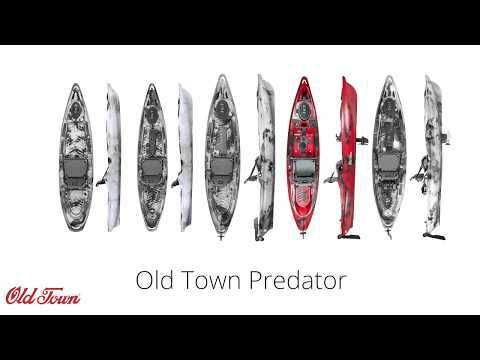 While Johnson Outdoors owns both companies, Old Town and Ocean Kayak, I did find some major differences that I believe set the Predator above the Prowler. 1: The molded in carry handles on the bow and stern. The Prowler features attached straps for the purpose, but a molded in handle can never break. 2. The no slip floor of the Predator. While it may not seem like a major point at first I have come to realize as much as I love to stand in the Predator I would miss the ribbed floor if I didn't have it. As stable as this kayak is, I can't imagine anyone sits down much. 3. Included scupper plugs. The Predator came with one-way scupper valve drains where the Prowler did not. I personally prefer to plug the scuppers as I feel it provides added stability, which may just be my opinion but take it for what its worth. With those 3 reasons in mind of why I prefer the Predator over the Prowler I'd also like to discuss a few features both incorporate into their designs that I could not do without. 1. The 3 position seat. It is extremely comfortable and easy to adjust for correct paddling posture. Just as it is intended to, the low setting is great for traveling while the higher setting is useful for providing increased vision which is huge to me because I use this boat primarily for sight fishing. My favorite part about the seat is the folded back position. I push myself through a foot or less of water most of the time while fly fishing and standing is simply the only option. I am also a fly fisherman and standing helps immensely in avoiding tangling line with paddles, poles, etc. 2. The rod pod. This locker allows you to store your rods beneath you and completely out of the way. There is no chance of catching them with a cast, hitting them on branches, or tangling lines. However should you need to switch quickly they are easily at your disposal. 3. The wide tri-hull. Being able to stand in this boat to sight fish absolutely makes it worth every penny. It is a silently, stealthy way to pursue fish and standing to increase your ability to see the fish you are pursuing is imperative. The ability to stand is for me, the most influential aspect of this boat, and the major factor in transforming fishing into a completely new experience. While not quite as major factors I do feel like it is also worth the time to mention the large, comfortable, easy to adjust foot rests, the pouches on the sides of the hull interior and seat back for storage, and the Scotty paddle holder that comes with the kayak. These features continue to add to the function of the boat and help it help you have a more enjoyable experience. To me a kayak is a tool. I bought one to allow me to access waters and pursue fish I wasn't able to before via the bank or in a motorized craft. While some tools may create unnecessary burdens this kayak has done nothing but aid and completely transform my fishing experience. I could not have picked a better boat suited for fishing than the Predator 13 and would encourage any fisherman who is serious about close quarters pursuit to purchase this boat above the competition. Like previous reviewer, I too ordered mine on a Friday and received around 10 am the following Wednesday. The carrier that ACK chose (Estes) was very professional and delivered with no issues. The kayak itself is everything I wanted in a fishing kayak. I'm around 240lbs and I've taken it on 3 extended fishing outings and feel extremely comfortable/stable in the Predator 13. I've only used it in the high seat position but standing up in it is literally as easy as just standing up. I've not attached many accessories to the kayak yet but it has plenty of room for whatever I might want to add. I highly recommend this kayak as well as ACK for fast and professional service! Ordered the camo version over the phone, along with paddle and accessories, on a Friday...it showed up Wednesday. This kayak is very stable and has a ton of storage room in the hull, and paddles very well. The seat is very comfortable. This thing is a fishing machine. I wanted a stable yak to fish from with a dry confort seat, I looked hard at the Hobie proangler but I love fishing shallow flats and bars and knew the Mirage Drive could be a problem as well as the extra weight of the Pro angler, the Predator 13 is wide and stable and needs a longer paddle to give you the torque in the water, I'm over 6' and 250lbs and I can flip the seat up and stand and paddle/fish with no problem, I flip the seat up so to keep my weight neutral from bow to stern, one word of caution is to make sure to buckle the seat down when you change the seat height or it can shift on you when twist or lean back in the seat, if your thinking about putting on roof rack the seat mount is above the gunnels so when flipped upside down it will be hit the roof of your car unless to have really raise cross bars, the Predator paddles and track good , I rented a Cuda 12 last summer for a week to fish out of but standing in it was not fun, I'm looking forward to spring fishing in my Predator. Let me just say I am not a little guy, 6'4 250 lbs. My first outing in my Predator and I was standing and paddling like nothing! I still have my Cobra fish and Dive, which is 2" wider, and nowhere near as stable. I love the built in features of this Kayak from the storage compartment up front, the ingenious one-way scuppers, the mounting plates and the transducer well. Fantastic kayak and ACK was fantastic to deal with. Kayak was delivered well packaged and exactly when they said it would be. Thanks again as I am a very happy and satisfied customer! This is my fifth fishing kayak so I have a pretty good grasp on what a fishing kayak should and should not do. For the most part the Predator 13 delivers on what it promises. The good: Super stable Super comfortable Lots of room for your gear Easy to stand in Neutral: Paddles ok, not fast, not slow Turns ok The bad: (Isn't there always?) Heavy! Only the brave will attempt to put this on top of a pickup. 72 pounds is the stripped hull less hatches, seat, and rigging. Traditional kayak saddles may dent the hull if positioned wrong. The hull does pop back out on its own. This kayak is my first but I did a lot of research and visit many times at various ACK. I was determine to buy the great Diablo but they are sold out and a long wait. They are awesome for rivers and marshes. I travel a lot and wanting something more versatile for fresh and saltwater no matter what the condition is. I was visiting Houston and stopped at the ACK in Houston Bissonnet st which just demo the new Predator 13 in Urban Camo. It look great and the seat has various sitting heights. Great price with many changing mounts for various usage, hideaway bag for your battery for your fish finder, to great area for your transducer to be stored. I placed my pre-order. I finally got it after waiting for production. I got it on the river and it was like a ferrari on the road. It is smooth ride, quiet and great to sneak on fish for a time. I was amaze how fish were swimming close to the Predator. Strong kayak to hold a 260 lbs guy with gear. I highly recommend this kayak to others. Q: I purchased a Predator 13 from you two years ago. I'm considering a second Predator 13. I understand the mold has since been changed by Old Town and I'm wondering what, of any, the differences might be between the 2015 model and the new 2017 model. Thanks. A: You won't notice much of a difference in the mold of the kayak. They've added two fishing rod holders to the side of the kayak, more cushion to the seat and a storage pocket below it. A: I apologize for the confusion. The red and green picture are older models, so I have let our marketing team know this. The 2018 models, which is the ones we have, are going to be what is shown in the second (white kayak) picture. Q: What roof rack is recommended for this kayak? I have the Yakima JayLow but want to understand the best way to transport this on the roof of an SUV, as a trailer is not an option for me. Q: What is the best kayak cart for the Old Town Predator 13? A: The stern of the kayak will fit a cooler up to about 20"x13"